ARGYLE, TX – Super Bowl week is under way in the Dallas-Fort Worth-Arlington area, with mobile video support from locally-based GoVision. The Dallas Cowboys, the North Texas Super Bowl XLV Host Committee and a host of corporations, event management firms, not-for-profits and venues have all enlisted visual support from the company's inventory of LED video screens. "This will likely go down as our busiest week ever," said Chris Curtis, CEO. "I've lost track of how many events we're doing, not just around the Metroplex, but all across the country. It's crazy, but it's a good kind of crazy." Walt Disney Pictures hired GoVision to drive a 9-by-16-foot "GoBig" unit around the Dallas-Fort Worth from Thursday through Sunday (Feb. 3 – 6) to promote its upcoming film I Am Number Four, produced by Michael Bay and Steven Spielberg through DreamWorks. The movie trailer will run continuously on the widescreen LED as a specially-wrapped GoBig truck travels to all of the Super Bowl hot spots, including the NFL Experience in downtown Dallas, Fort Worth's Sundance Square and, of course, Cowboys Stadium in Arlington. The Dallas Cowboys also entrusted GoVision – its partner on the eight portable LED screens mounted in Cowboys Stadium's outdoor plaza during football season – with another element of its Super Bowl game-day management. The company installed, and will maintain, two new 9-by-16-foot high-definition LEDs in the stadium's Standing Room Only sections. The areas, which afford views of the field but not the world's largest HD screen that famously hangs from the ceiling, was set aside to allow thousands more fans to attend Super Bowl XLV. GoVision will make sure these ticket-holders enjoy the complete game experience. For the second year, the North Texas Super Bowl XLV Host Committee is featuring the company's screens in its booth at the NFL Media Center. 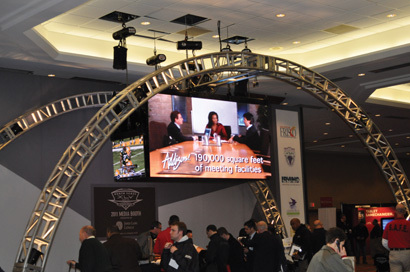 GoVision used 14 Daktronics PST-6i-b panels to create a mockup of the center-hung screen at Cowboys Stadium, and suspended it over the committee's welcome booth at the Dallas Sheraton Hotel. GoVision also installed two 9-by-16-foot Everbrighten BR7 LEDs on both sides of the main stage at the "Bud Light Hotel" in Dallas. Anheuser-Busch took over the 193-room Aloft Dallas for the week and transformed the hotel's parking lot into a 3,500-seat concert venue under a Texas-sized tent. The high-resolution, lightweight screens will provide attendees with a closeup look at live performers including The Fray, Lifehouse, Ke$ha, Nelly and country stars Dierks Bentley and Jack Ingram. GoVision's 9-by-16-foot Daktronics PST-12HD LEDs will be featured in Academy Sports' tent during DirecTV's 5th Annual Celebrity Beach Bowl on Saturday. The event, held in downtown Dallas' Victory Park, features celebrities and former NFL stars competing in a flag football game played on one million pounds of sand, with Maroon 5 performing afterwards. In addition, GoBig and GoTron units will be featured at several game-watching parties, including events hosted by a group of churches in Arlington, a mega-church near Houston and a popular Arlington restaurant. GoVision is also sending GoTron units to company hospitality events outside Cowboys Stadium, and two GoBig units are en route to corporate events in Green Bay, WI, and Pittsburgh. In addition, the portable screens in the Cowboys Stadium plazas will be front-and-center throughout the international game-day broadcasts. FOX's pre-game set will be stationed directly under one of the Daktronics PST-12HD video panels maintained by GoVision. "We're always busy during Super Bowl week, but having the game in our back yard has taken it to another level," said Curtis. "Our long-standing ties to the Host Committee, the Cowboys and several NFL sponsors have really paid off in a big way. Though the weather has put us to the test this week, they know we won't let them down."